This system is designed for use with modern paint stripping technology that replaces methylene chloride and traditional hot alkaline strippers. 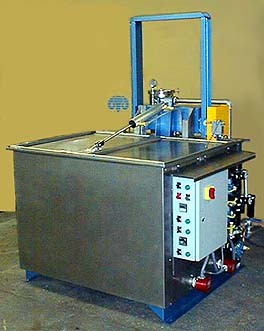 It is built using heavy gauge stainless steel for the processing chamber and exterior stainless steel insulation panels. The system comes in a variety of sizes and load capacities. The unit pictured above has a 255 gallon capacity and can handle a 45″L x 30″W x 20″H volumetric load weighing up to 1000 pounds. An automatic opening and closing cover is included to reduce emissions and save energy. A Nema 4 rated electrical enclosure includes selector switches, pilot lights, digital indicating temperature controller, digital cycle timer and lockout-tagout disconnect switch. The inside of the processing chamber (shown above) features structural stainless steel channel for the elevator and an expanded metal work grid. 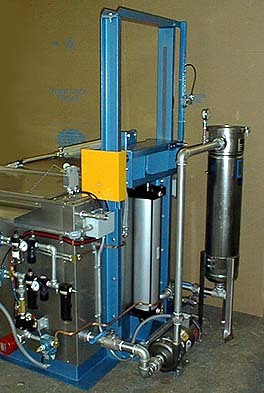 A Super TurboFilter system is added to accelerated the stripping process and remove loosened particulate.